There was a tangible sense of hope in the air as the New Year approached. (a celebration) of the two thousandth anniversary. I messed up the millennium. I really did. Specifically, I messed up the bimillenary, the marking of 2000 years since the birth of Christ and the start of our calendar. The build up held such promise! 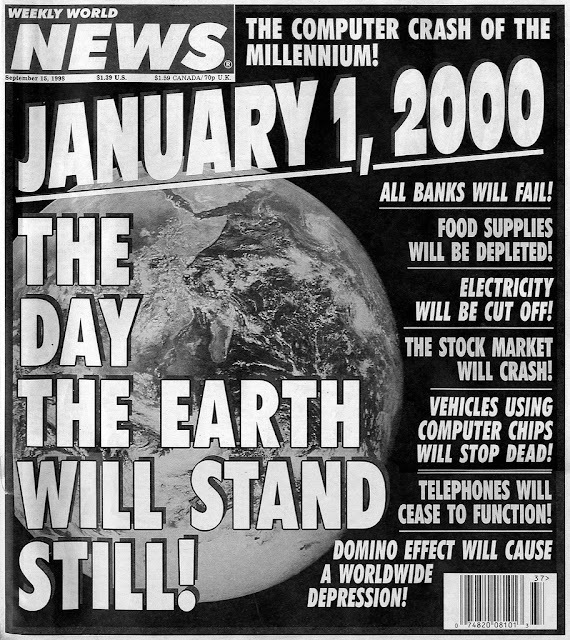 The Y2K bug was holding the world to ransom - planes were going to fall out of the sky, fridges were going to run warm and I'm pretty sure someone touted an alien invasion at some point. It was exciting! A new era; an apocalypse; an overthrowing of everything that was a bit rubbish in the world, and the possibility of not having to go to work on Monday morning. But no; despite all the hype, I messed it up. Having just broken up with my girlfriend, I offered to house-sit for my sister in central Oxford so I could wallow in self-pity, alone on the couch, in front of the TV, the pyrotechnic cracks and whoops of celebration from the streets below echoing around me, watching on the BBC as those damnable Frenchies upstaged the entire world by setting the Eiffel Tower on fire in a ridiculously suave and classy manner. And that was it. I sat indoors and watched the End Times roll in on the TV. I didn't even have any alcohol - I had meant to take out a supply of cash (as advised for when the banking system collapsed), but I had forgotten and so had no money to buy any beer to even dull the moment. I had to sit there, fully sober, as the entire world around me celebrated (including the audacious thief who, just a few streets away, was at that very moment in the process of abseiling through the roof of the Ashmoleum Museum, replete with smoke grenades to obscure the security cameras, to pick himself up a little souvenir of the Cezanne variety). I wasn't the only one that didn't show up to the party though. The whole Millenium Bug malarky turned out to be a complete damp squib: the lights didn't go out, the banks didn't collapse, and I had to turn up for work on Monday morning. It's fair to say that the Millennium or Bimillenary or whatever you want to call it was so rubbish that I'm in no hurry to have another one. And there will be, you know? Did you know that they're already touting the Y10K bug? Well they are, and I bet that'll be just as rubbish too. Where were you on 31st December 1999? Were you similarly disgusted by France's coup de git? Or were you so busy abseiling at that precise moment that you missed the countdown. Do please leave comments below. I was 10, almost 11, when the year 2000 came along. I messed it up by being too young to care about anything but watching fireworks from 3km away. Hey Bibi - seeing as you were so young at the time, do you remember all the Y2K panic, as described (rather hysterically) in the above newspaper article? My parents kept us not all too updated on what was said in the media, because we were young, and when you're young you shouldn't have to care about grown-up concerns. (a wise move, methinks. My 11 yo cousin's been reading the papers for a good few years now and suffers frequent nightmares on wars and terrorist attacks). This doesn't mean we were kept stupid, it's just that everything was monitored. I was driving round a roundabout in Eastbourne, southern England, listening to a dodgy tape of Blur's 'End of a Century.' When 2100 comes, I'm going to do it all over again, but with a blanket because the heater in my VW golf was rubbish. Yeah, I'd like to say I'd do it again, but I'd probably still stay in and watch TV, and I'd probably still forget to buy any beer. New Year's Eve has always been a depressing holiday for me. I usually spend it at home with family members, many of whom go to sleep and we have to wake them up just before the countdown. The most fun event of the evening is talking with my sister about how depressing this whole thing is. Millenium night was no different. p.s: did you watch Gatsby after all? did you make a Goodreads account? Nooooo!! *thumps desk* But I will ... it's left the cinemas here now, but I'm waiting for it to be on one of those special late night showings, because I hear you *really* should see this one at the cinema. Well the Y2K bug must have affected my brain as oddly one who remembers everything can't think what I was doing on that New year's eve (probably tucked up in bed as I have no memory of it). You on the other hand reminded me of a male version of Bridget Jones! !